Missouri, the ‘show me’ state, is showing the country an interesting and novel concept. Judges there will be apprised of the financial costs of various punitive options before issuing a sentence. For example, a judge would be informed that a convicted drug user could be sentenced to 5 years in prison for $50,000, or could do community service with a probationary period instead for a fraction of the cost. Blind justice? This new policy has generated spirited debate. Some welcome the reform, which aims to bring some measure of cost sanity to the justice system. Others oppose the effort arguing that justice must be meted out without regard to financial costs. Is this issue being driven by difficult economic realities? Some are hostile to incarceration for reasons independent of its exorbitant expense. These folks favor rehabilitation and treatment over confinement as a matter of policy. Is there any cost of justice that is too high? I viewed this report through the prism of a practicing physician, a member of a profession that spends much too much of other people’s money. Similar arguments against cost control are made by those who feel that medical costs should not be a factor when treatment options are being considered. This point of view is the backhoe that has dug a hole so deep, that we can barely see daylight. Patients never ask me about the cost of my recommendations when their insurance companies are paying the bill. When I was a medical resident, I recall when tissue plasminogen activator (TPA) was launched for the treatment of acute myocardial infarctions. It cost a fortune, compared to the existing clot buster streptokinase, and had no significant advantages with regard to safety or efficacy. This seemed irrational to a 2nd year medical resident, but my confusion must have been the result sleep deprivation. In general, new medical stuff costs more, but doesn’t necessarily do more. The New York Times this past week reported on a controversy on cost effectiveness published in the current New England of Medicine issue. The reporter writes: How much should healthcare providers pay for expensive treatments that make relatively small improvements? The Times article caught the attention of Medrants, who offers his own commentary on the issue. For those who are not lawyers or physicians, consider an everyday example of what occurs when you can charge a bill to someone else’s credit card. First Example: A hardworking Dad takes his wife and 2 kids out to dinner. “Okay kids, order off the kids’ menu and Mom and I will share the early bird special. Drinks? Nothing more refreshing than ice cold tap water!" Second Example: The same Dad, who is salesman, meets a client for a dinner meeting. Cost consciousness has never gained respectable traction in medical practice in physicians’ offices or hospitals. Doctors dispense expensive care to patients and send the bills elsewhere. No wonder so many folks expect and demand ‘foie gras’ medicine. And we physicians are happy to serve it up to them. I have argued previously that if patients had some financial ‘skin in the game’, that it would serve as a brake on overutilization. Patients and families would make different decisions with regard to experimental treatments, end of life care and endless diagnostic inquiries, if they bore some measure of the cost of these endeavors. Of course, we do not want to deny sound medical care on the basis of cost, but cost must be a consideration. Isn’t this what every one of us does when we are shopping, taking a vacation or buying a car? If we physicians were apprised of the cost of our medical recommendations, similar to Missouri judges, it might influence us when we advise patients. At present, we order tests and medications with no price tags attached. We physicians often don’t know the cost of our diagnostic and treatment plans. If we did, perhaps, certain remedies, such as a tincture of time, would gain currency in our offices. My pricing may not be entirely accurate, depending upon one’s insurance status, formulary discounts and other discounting. But, you get the idea. Imagine how much health care reform would erupt if the cost of our medical advice, including the alternatives, flashed on a big screen in our exam rooms, and the patient was responsible for a fair share of it. I think that Missouri has a lot to show us. Electronic Medical Records, Surgery or a Grand Canyon Hike - Which Hurts More? Two weeks ago, I did what had to be done. Months of procrastination had to end. Fears had to be put aside. Anxiety and misgivings had to be overcome. Second opinions always confirmed the need to proceed. So, when the excuses ran out, I jumped. What decision did I make? (a) Finally have rotator cuff surgery? (b) Begin electronic medical records (EMR) in the office? (c) Retire from medicine to be a full time ‘Whistleblower’? (d) Agree to a family vacation when we will hike up and down the Grand Canyon sans mules? (e) Agree to become an expert witness for a medical malpractice plaintiff’s attorney? (f) Apply an Obama 2012 bumper sticker on my car? Two weeks ago, our office entered the paperless universe. The era of ink on paper was over. The manner that I had seen office patients for 20 years suddenly evaporated. And, I wasn’t happy about it. For our small group of gastroenterologists, even though we are aware of the potential advantages of computerized charts, we adopted EMR because we had to. For me, I was perfectly satisfied seeing patients in the office the old fashioned way, similar to how physicians have treated patients throughout history. Prior to 'point & click medicine', I had lots of time for eye contact and observing patients’ body language and facial expressions. I have previously expressed my concern about EMR adversely affecting the doctor-patient relationship. My written chart notes were in my own unique verbiage, code words and phrases that could convey my precise meaning when reviewed months or years later. True, I couldn’t access patient records from remote sites, but somehow we managed to get the job done without tragic consequences. EMR is a cure, but I wasn’t aware that my practice was diseased. So, now I face patients with a laptop, loaded with software that I don’t fully understand. I am clicking, pasting, free typing and spending minutes searching for some common term like hemorrhoids to insert into the history of present illness. During the first week, I have sorely tested my patients’ patience, and my own. Since, I don’t want to communicate to my patients my frustration, annoyance and trepidation, I try to make the experience seem like it's all jolly-good fun. I maintain a fixed smile of delight that must make patients think I administer an hourly Botox injection. Looking deliriously happy when I want to smash my laptop to shards is hard for someone with no acting skill or talent. Therefore, I \prepared some cue cards to assist me. Here’s a sample. Do Not Say: I hate this system and so will you. Say: Isn’t this wonderful? I can now search my whole practice for all of my porphyria patients. Do Not Say: Remember how you used to wait a half hour in the waiting room for your appointment? Those were the ‘good old days’. Say: My partners can view your medical history even at 3:00 a.m. Try it out this weekend when I am not on-call. Do Not Say: I wonder who can hack into these records? Say: Of course, this will really improve your medical care. I already clicked that you are feeling better. Do Not Say: I can check my email during office visits and patients think I’m looking at their EMR charts! Of course, it will deliver many improvements for patients and physicians, as pointed out by überblogger Musings of a Distractible Mind . I am excited to have access to my patients’ records from anywhere. It has been vexing to receive phone calls at night from my partner’s patients with stomach pain, when I do not know them, and have no access to their records. E-prescribing will save time and screen for important drug interactions and allergies. Letters can be sent to referring physicians at the time of the office visit automatically, although the software writes them in a robotic fashion. Ultimately, all EMR systems will communicate with each other, so that a patient seen in an emergency room can have medical records accessed from any EMR system. By then, patients should be carrying a flash key or a microchip containing all of their medical history, radiology images, EKGs, etc. While on balance, EMR is a true reform that will improve medical quality, it won’t make everything better. It will take great effort by physicians to prevent EMR from dehumanizing our personal interactions with our patients. This is a formidable task, and many of us will not fully succeed. We should not simply consider the medical outcome, but also the path and the experience that precede it. For example, we would sustain ourselves on Ensure or Meals Ready to Eat (MRE) for life. This would save us time and money. But would it be worth it? When we focus only on the medical outcome, then our humanity is at risk. While the nutritional analogy above isn’t a perfect fit for the EMR issue, I hope you will agree that there is a connection. What do other physicians think about EMR? More importantly, I am interested in the views and experiences of real, live patients. For those who are dissatisfied, how can we physicians do better? If I do end up at the bottom of the Grand Canyon, and the National Park Service adds WiFi service there, should I take my laptop with me? While my feet are dangling in the Colorado River, I can refill prescriptions. 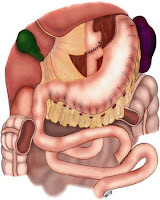 Gastric Bypass Surgery: Cure or Disease? Last week, a female patient saw me in the office for the first time to discuss her chronic digestive issues. Luckily for her, my recommendations did not include probing into her alimentary canal with the endoscopic serpents that we gastroenterologists rely upon. As the visit concluded, she advised me that she intended to have a gastric bypass (GIB) procedure performed, and even used the medical term of bariatric surgery. I suppose that she mentioned it because the issue falls within my specialty, and she wanted my reaction to her plan, although she didn’t directly solicit my opinion. Nevertheless, she received it. I am not surprised anymore when the critical medical issue emerges at the end of the office visit. Every physician has this experience regularly. What struck me about my bypass seeker was that she didn’t appear to have the bulk that would justify weight loss surgery. Sure, she was overweight, but she was thinner than many patients are after undergoing a gastric bypass operation. She was in her thirties and was not suffering from any pulmonary, cardiac, endocrine or rheumatologic consequences of obesity. She simply wanted to be thinner. I asked her what other treatments she had pursued, since clearly surgical treatment of obesity should be the last option. A patient’s typical response to this inquiry is a narrative describing a series of diets and medications that produced only modest and transient benefit. When no other means can peel the pounds off, and the health consequences of the heft are significant, then surgery is worthy of consideration. But, this is a very weighty decision and the scales should not be tipped too easily in favor of surgery. This patient had never been on a serious diet or enrolled in a weight loss program. I suggested Weight Watchers, a legitimate, effective and affordable program that encourages the client to make lifestyle changes that are sustainable. Of course, we live in an era of short cuts and gimmicks where infomercials promise us potions that will transform us from Michelin Men into taut lifeguards in a matter of weeks. She responded that she doesn't have the time for the meetings. Doesn't have the time? My patient had no clue how much commitment and discipline gastric bypass surgery demands. If she couldn’t accommodate a weekly meeting, then how would she ever accommodate to her new intestinal anatomy? She was exactly the wrong candidate for the operation. I explained to her that gastric bypass is major surgery with all of the risks of any abdominal surgery. More importantly, I emphasized to her that even when the operation is successful, it changes your life every single day forever. The dining experience, one of society’s most important social and familial forums, would be irrevocably altered. Bypassed patients knowingly forego gastronomical pleasure to serve a greater good. Moreover, a gastric bypass procedure can redirect the internal plumbing, but it cannot unravel the psychological aspects of the disease. If the latter is not properly treated or screened for, then patients can undergo a bypass and actually gain weight. There is no bypass that can restrain a patient from ingesting several milkshakes a day. Removing an appendix or a gallbladder won’t change your life. GIB profoundly disrupts nature’s digestive system. Only very small meals can be ingested. There are a host of nutritional deficiencies that can arise, because there may not be sufficient intestine available to absorb necessary nutrients. Do I favor the operation? Yes, but only for a proper candidate who has been carefully vetted by medical and psychiatric professionals. Hundreds of thousands of Americans will have the surgery this year. The medical threshold for determining eligibility for bariatric surgery is becoming steadily lower. I wonder if the acceptance criteria have become too lenient. Of course, the operation is being marketed hard across the country to keep operating rooms humming. Bariatric surgery is big business. Will this patient get the operation? I hope not, because I don’t think she has the mettle for her post-operative life. If I were the consulting surgeon, I would certainly ‘bypass’ her and direct her back to some treatment options that really work and have no risk. Once again, I know that GIB is the right choice for many patients who are suffering and have no other remedy available. But, we live in a ‘cut & paste’ society where we often opt for short cuts and secret passageways to success. GIB is no short cut; it’s a surgical incision that may create a deep wound that will not heal.